It might have been a while since you have experienced this type of stress, and as an adult it might be so much more difficult. In StudyOnline.ie we know very well that exam anxiety is one of the struggles that majority of ACCA and CPA students face on a daily basis. First off, try to remember that no matter how much you stress over the exam it will not change anything. Ask yourself, why do I get anxious and most importantly how can I cope with the stress during that time? Current literature identifies four dimensions that causes us to get anxious during examinations: worry, emotionality, interference, and lack of confidence. According to various researchers worrying about our exam results and our skills being tested can impact on our performance! Keep that in mind next time you are feeling anxious and stressed before an exam. Studies have also identified various ways of coping with pre-exam anxiety and stress. Among others, task orientation and preparation are one of the preferred mechanisms used by people experiencing worry and emotionality. Those experiencing interference often seek social support, and those lacking confidence turn to avoidance. No matter what dimension of stress you experience and what kind of coping mechanisms you apply, it is important that you realise that what you experience is normal and within your control. We have prepared a short list of ways you can minimise the stress, take back control over your emotions and stop feeling overwhelmed. First, prepare and organise well before your exam. Having all your information on hand and ready will take away at least some of the stress. Make sure you know all the necessary details for your upcoming exam (examination centre address and contact details, are you traveling by bus or car, where will you park the car, how long is the travel during that time of the day, do you have all you need in terms of stationery and documentation etc.). Seek support from friends and significant others. You don’t even have to talk about the exam and the stress you are experiencing, simply inviting a friend over to have a chat and spending some time relaxing can do wonders. Allow yourself to forget about it for a moment. Remember to take breaks during your revisions. The few weeks before the test can be nerve wrecking and exhausting both emotionally and physically. It is not only good for your mental health to take proper breaks, but it is also good for material retention. Making a rule about not studying and revising the day before the exam and instead relaxing and having a good night sleep will be a game changer. Trust us, if you haven’t learned it already, the 24 hours before the exam will not make a difference! Trying to cram the day or even hours before the exam will only add to the levels of anxiety you’re experiencing. Ditch the books 24 hours before the exam and spend the day relaxing as much as you can, watch a movie, go for a walk, spend some time reading something enjoyable to help you forget about the upcoming exam. Most important thing you can do is having a good night sleep. 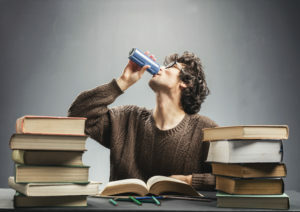 One of the biggest mistakes made by students before the exam, is drinking lots of coffee and energy drinks. That kick they give you is great for half an hour, however, too much caffeine can worsen your anxiety and disturb your sleep. Try to keep caffeine intake to the minimum and do not drink coffee in the evening to keep awake and study at night. Especially the couple of nights before the exam! Your sleep pattern will be disturbed resulting in not getting enough rest the night before the exam. Worst of all, your ability to recall learned information will be negatively impacted as well. Remember and remind yourself that no matter what happens, there are options to revise and repeat the exam. If you ever need help studying and revising for your ACCA or CPA exams let us know! Stöber, J., 2004. Dimensions of test anxiety: Relations to ways of coping with pre-exam anxiety and uncertainty. Anxiety, Stress & Coping, 17(3), pp.213-226.